Tue, August 21, 2018 10:00 A.M.
Intermediate Grant Writing is a working session that will provide the opportunity for grant writers to receive extensive feedback on their proposals from peers and professionals in the nonprofit field. We will review aspects of a good grant proposal, practice writing an actual grant, and receive constructive feedback on written proposals. Participants are encouraged to bring completed or semi-completed proposals and laptops/tablets, though none of these materials are required for participation. Prior experience or familiarity with the grant writing process is recommended. 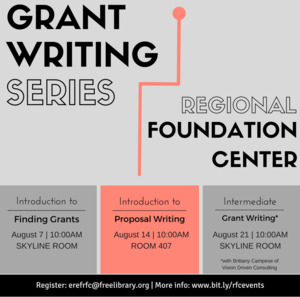 If you are new to grant writing then we encourage you to take Introduction to Finding Grants (8/7/2018) and Introduction to Proposal Writing (8/14/2018) being offered by the Regional Foundation Center. If you cannot attend our in-person programs please watch the webinar versions available on Grantspace. This program is presented by Brittany Campese, owner of Vision Driven Consulting, LLC., a Philadelphia-based business that supports the visionary work of individuals, community groups, and not-for-profit organizations. Advance registration is required as space is limited; please contact the RFC at erefrfc@freelibrary.org. Tuesday, August 21 | 10:00 a.m. - 12:00 p.m.